TOMS RIVER – The people who recently crowded into St. Andrew United Methodist Church on a rainy night were on a desperate search for information. Most were Sandy victims, and many still are trying to rebuild their homes more than two years after the superstorm struck. The meeting, presented by the Ocean County Long-Term Recovery Group, was intended to give these people one of the things they need most — information to navigate the state’s Reconstruction, Rehabilitation, Elevation and Mitigation (RREM) program. “You’re not in this alone,” Sue Marticek, executive director of the long-term recovery group, told the crowd. As she often does, Marticek cites some sobering statistics from Hurricane Katrina, which devastated parts of Louisiana and Mississippi in 2005. Katrina “is the best crystal ball” for the recovery in New Jersey, Marticek said. If so, the aftermath of that storm is sobering: 18,000 homes are considered not in compliance by U.S. Department of Housing and Urban Development, and HUD is seeking $522.2 million back from those homeowners. The homeowners received grants through Louisiana’s Road Home program, but have failed to properly elevate their homes, HUD claims. Many homeowners were defrauded by unscrupulous contractors, while others used the money to pay their mortgages or did not receive enough grant funds to rebuild and elevate. Now they are stuck in a kind of bureaucratic limbo. Marticek does not want that to happen here. “It’s not what we want to see,” she said. The county long-term recovery group is an umbrella organization of 80 nonprofits. They attempt to bring Sandy survivors together with available resources while also bridging funding gaps that have prevented many homeowners from being able to rebuild. The RREM workshops are the long-term recovery group’s attempt to prevent that Louisiana situation from happening in New Jersey. Sheri Kahn, who formerly worked at the state Department of Community Affairs, leads the sessions, explaining to homeowners how RREM works. Upcoming workshops include one at the Ocean County Library’s Toms River branch, from 10 a.m. to noon Dec. 6, and one Dec. 9 at St. Mary’s Church in the Manahawkin section of Stafford. Marticek said she hopes to schedule a workshop in Monmouth County shortly. “This system is a long process, and it can be very confusing,” Kahn said. She urged everyone in the room to get a disaster case manager through the long-term recovery group. The case managers walk homeowners through every step of the rebuilding process. Marticek said homeowners who need to vacate their houses and have a set start and end date for construction can get assistance from the long-term recovery group for the costs of renting a place to stay during the construction period. The group also can pay for items such as design costs and offer volunteer labor to bridge the gap between the RREM award and the actual cost of rebuilding and elevating a home. At the recent workshop, Kahn ticked off a list of points that homeowners should know, including perhaps the most important one; the moment a property owner signs an RREM grant award, a lien is placed against their home. It is not lifted unless the home is found to be in compliance, which means it must be elevated to a height that either meets or exceeds municipal requirements. Any installed appliances must be energy efficient. Bedrooms must be at least 80 square feet. Homeowners who have taken out personal or home-equity loans to make ends meet in the two years since Sandy will not have the funds subtracted from RREM grant awards, Kahn explained. But Small Business Administration loans are, if they were used for construction. But if they were used to replace the contents of a home, they do not count against the grant award. “You must document everything,” Kahn advised. 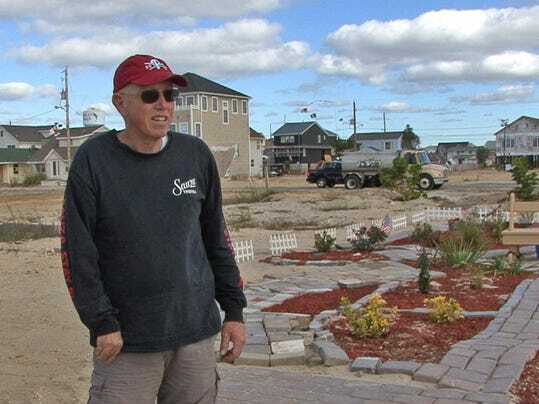 Ortley Beach resident Bill Mullen is hopeful that construction will soon begin on his new home on Coolidge Avenue. Mullen’s home was destroyed by Sandy’s storm surge, and the retired social worker has been living inland, at the Villages at Bey Lea, while he waits for rebuilding to begin. He came to the meeting to see if the long-term recovery group could help with his tax bills — the answer was yes — but like many at the meeting, he said he had learned a lot more. “This was very enlightening,” Mullen said. For more information on the Ocean County Long-Term Recovery Group or its workshops, call 732-569-3484. For more information about the Ocean County Long-Term Recovery Group, call (732) 569-3484, or email Info@OCLTRG.org. For the Monmouth County Long-Term Recovery Group, call (848) 206-2554.